Delighted to be involved in the production of my new play in the autumn at Pleasance Theatre, Islington. One street, one family, three stories. 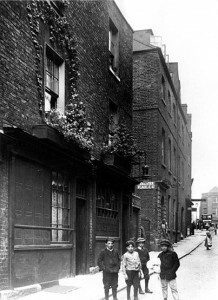 “Saffron Hill” follows the lives and fortunes of generations of a fictional family in Saffron Hill, Clerkenwell from the 1870s to the 1960s. The play explores, through the eyes of this family, the issues, attitudes and music of the times. Although based around historical events, this is very much the stories of the personal lives loves and losses of Italian immigrant families living in this area. It is 1872 and Giuseppe arrives in Saffron Hill, London to start a new life with his two daughters, Rosa and Lucia. They find England cold and unwelcoming, work is hard to find and poverty beckons. Lucia finds work at a music hall, but unscrupulous landlord Samuel Peters threatens to drag her into the dark London underworld. Two generations on, the family has established a successful ice cream business run by Sofia and Roberto, Vita and Lorenzo. However, in 1940, the tide turns when Italy enters the War. Roberto and Lorenzo are detained under Churchill’s “collar the lot” policy and are set to be deported to Canada aboard the Arandora Star. Years later, in 1967, Lorenzo and Vittoria’s children Antonio and Carlotta now run the business, a coffee shop, with Antonio’s wife, Maria Vittoria. A distant cousin, Giovanni arrives from Italy determined to find success. Carlotta falls in love with him, but soon discovers she is pregnant. How far will this “modern girl” and her family go to adapt to London in the “Swinging Sixties”?